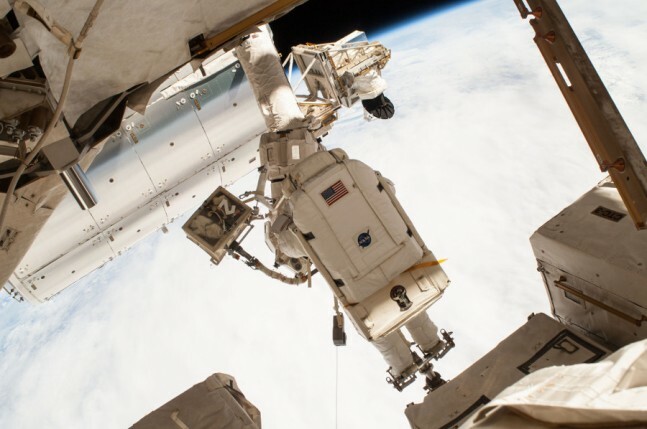 On Wednesday, Barry Wilmore and Terry Virts completed their second of three spacewalks to install cabling on the outside of the International Space Station (ISS). Both astronauts started at 6:52 a.m. EST. The primary focus was the continued preparation for the arrival of a set of docking adapters for commercial crew vehicles. Both Boeing and SpaceX are targeting commercial crew missions to the ISS some time in 2017. In addition to the running of power cables, Wilmore and Virts also lubricated the Latching End Effector on the Canadarm2—the robotic arm on board the station. Virts spent more than two hours lubricating the intricate capture mechanisms on the end of the station’s Canadian-built robot arm. The team also prepared the Tranquility module for the upcoming reconfiguration of the docking adapters. While they did have issues with a protective cover during the walk, all the planned work was completed successfully. Even with minor difficulties, the duo finished early enough that they were able to perform some get-ahead work in advance of Sunday’s third and final spacewalk. The spacewalk officially ended at 1:34 p.m. EST when Wilmore and Virts closed the hatch leading inside the station. The mission was not without its mishaps, however. Virts’ spacesuit developed a water leak. 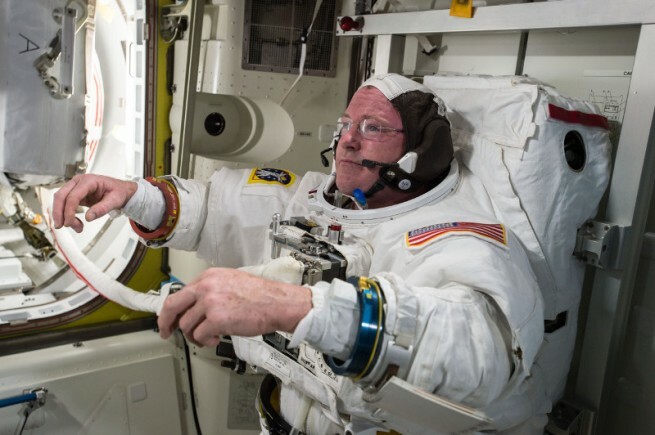 He reported a small amount of water in his helmet when he returned to the station’s airlock. European Space Agency (ESA) astronaut Samantha Cristoforetti told flight controllers in Houston, “Terry was saying he’s got some water in his helmet, he just noticed it a minute ago. It’s about 3 inches in diameter, it’s kind of pooling on the front side of the helmet above his eye level, and he does feel a little bit of squishiness in the back of the HAP (helmet absorption pad).” The fact that the pad was only moist and not saturated indicated the leak occurred late in the spacewalk. NASA engineers have determined that the leak was not from the drinking water supply system. The leak may to be similar to the one experienced by Luca Parmitano during his spacewalk in 2013. The engineers will be troubleshooting the issue to see if a resolution is possible before the next spacewalk on Sunday. This marks the 186th spacewalk performed by astronauts, though it is also being called EVA-30. Wilmore and Virts will start the third and final spacewalk on Sunday, March 1 at 7:10 a.m. NASA TV coverage begins at 6:00 a.m.